The international community knows practically nothing about Turkmenistan. Colossal gas fields, suppression of the opposition, golden statues of president for life Saparmurat Niyazov - that is essentially all. Still, the Turkmenbashi's demise paved way for changes, and Turkmenistan nowadays is somewhat different from what foreigners think it is. The piece that follows was written by a foreign journalist who visited Turkmenistan for the first time. 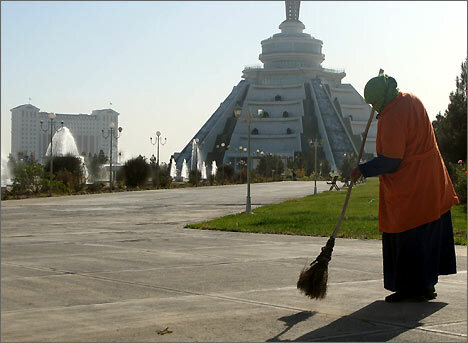 The international community knows practically nothing about Turkmenistan. Colossal gas fields, suppression of the opposition, golden statues of president for life Saparmurat Niyazov - that is essentially all. Still, the Turkmenbashi's demise paved way for changes, and Turkmenistan nowadays is somewhat different from what foreigners think it is. Chances to visit Turkmenistan for foreign journalists were practically nonexistent barely a year ago. They are not much better these days, but some journalists make it all the same. Bewilderment is the first impression. Where is tight control typical of all authoritarian regimes? Nobody from the customs service or airport security bothered to take a second look at our trolley filled with cameras and suchlike technical contraptions. The feeling of bewilderment lasted all through the route from the airport. Brand-new Land Cruisers, BMWs, and Mercs whispering along the streets. How did they ever make the country as isolated from the rest of the world as Turkmenistan was? Uzbekistan nearby is authoritarian as well, but posh autos like that are certainly rare there. 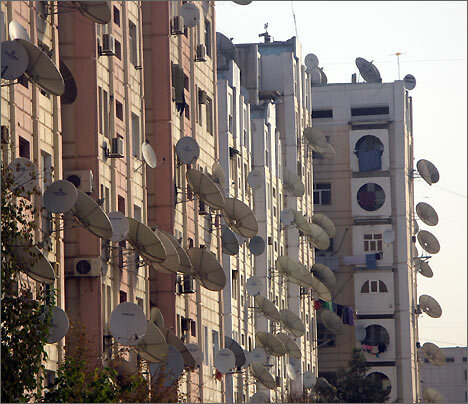 Every tenement we drove by bristled with dish antennae, a clear indication of free access to Western and Russian TV broadcasts. This feeling of freedom was the main source of wonder. Where was total surveillance? Or "curators" from secret services telling us what was permitted and what not? How come people in the street do not leave us in a hurry upon being asked to talk to a Western correspondent? These and other similar questions wouldn't let go, at first. The impression I had had of Turkmenistan and its regime was that the fear was all. Having read so much about human rights abuses, arrests of opposition leaders, and all-permeating control, I expected to see in Turkmenistan something like Islam Karimov's regime in Uzbekistan. Even something worse, actually, because the opposition in Uzbekistan is given at least some leeway. In any event, there was no tension this correspondent could feel in the Turkmens. No fear, no suspicions that the neighbor next door is an agent provocateur, or that the conversation with foreigners will be reported to secret services. On the other hand, people do fear to criticize the authorities or protest in demonstrations. All of that is still impossible in Turkmenistan. This element of fear cannot be felt in everyday life, something one automatically expects in a country where the state controls it all. The fear the Turkmens experience is not, however, of the kind that saps the will and energy and transforms one into a voiceless slave of the regime. 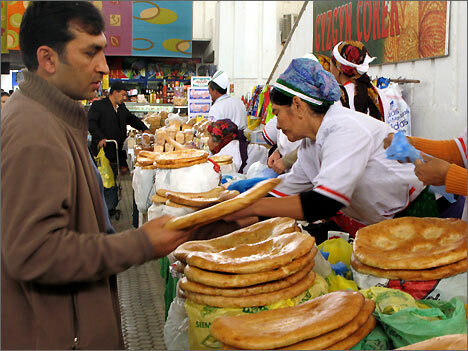 Even tete-a-tete, most Turkmens claim that they are quite content. Many sincerely believe that they live in the best country in the world. Their gay looks, their festivities and weddings, their hospitable amiability are incompatible with totalitarian society. "Why wouldn't they be content? They do not know any alternatives. They are brainwashed into thinking that Turkmen society is ideal," to quote Tajigul Begmedova of the Turkmen Helsinki Human Rights Foundation. The impression, however, is that there is more to it than propaganda alone, that there must be some other factors at play that help the authorities. This correspondent couldn't rid herself of the thought that the authorities had some sort of tacit agreement with the people, some sort of social contract perhaps. The state sees to the people's well-being and living standards in return for political loyalty. It is this phenomenon that Western media outlets usually miss. Instead of trying to understand Turkmen society, they view it through the prism of liberalism. What they see therefore comes down to president for life Niyazov, personality cult, harassment of dissent, and absence of freedoms. All of that exists in Turkmenistan indeed. On the other hand, the same Western media outlets cannot explain why the Turkmens never revolt if everything is as sinister as these media outlets present. Or why the Turkmens keep praising their country even on return from trips abroad. The new leadership retained the "social contract". One-party system, absence of independent media outlets, swift prevention of all and any opposition. Fear to criticize the authorities. All in return for relative social well-being. The population of Turkmenistan is not charged anything at all for communal services including gas, electric power, or water. Filling up an auto costs $1, same as airplane ticket anywhere inside of the country. Monthly ticket costs $2.5. Bread is available at $0.1, onions and carrots at $0.25, potatoes at about $0.7. Average income is not much with the salary averaging $100. Very many complain of unemployment. All the same, it will be wrong to assume that the impoverishment is total despite what certain "experts" are saying. Very many grumble at the quality of medical care and education gone down the drain under Niyazov. The new leadership did amend the "social contract" some: pensions were restored along with ten-year education term, foreign diplomas are recognized and accepted again. Niyazov's past is everywhere in Ashkhabad. Golden statues of Turkmenbashi the Great decorate streets of all Turkmen cities. His portraits, however, have given way to new President Gurbankuly Berdymuhammedov's. Buildings of marble and colossal monuments with fountains leave one nearly speechless. Streets in the meantime are surprisingly deserted. Whisper of the fountains is practically all to be heard outdoors, nothing else. Street-sweepers, however, are out in force - sweeping and washing the sidewalks. Their bright orange uniforms are clearly seen from a distance, usually hovering in empty alleys and near fountains. They do keep the city clean. School uniforms are another distinctive feature. Girls wear long monochromatic skirts and scarves (the tahja). Long braids are a must. Boys wear suits, ties, and skull-caps (make tahjas). Every Turkmen city has schools where students are taught in Turkmen and Russian. Turkmens talking Russian are not a rare sight. The Russian language is less frequently used but understood all the same in rural areas. All entertainment establishments in Ashkhabad close at 11 p.m.. The locals believe that it is good for morals and public order. There are, however, night clubs or restaurants for whoever thinks that "the night is still young", usually located in expensive hotels frequented by foreigners. Ashkhabad stands for City of Love. It so happened that we visited Turkmenistan in the season of weddings. Bells ringing on brides' gowns, booming drums, and fistulas accompany wedding processions to the traditional site - golden status of the Turkmenbashi. Friends and relations dance all around the newlyweds. Bride's face is the only part of the body left uncovered. The decorations she wears weigh up to 40 kilograms. Seeing foreigners, the bride we encountered lowered her face. It is a tradition that the bride mustn't talk to her in-laws for 40 days following the wedding. She communicates with all males only via her new husband, other women, or children. Love and wedding parties, laughing and happiness are not what comes to mind first when Turkmenistan is mentioned. All the same, they constitute an integral part of life in this country. Newlyweds symbolize the new Turkmenistan - or so we earnestly hope.